March | 2012 | Eugene is huge! John Lennon, the most progressive guy ever, right? I know it’s tired by now. The blackface incedent has been talked about to death by this point, mostly by people who are not black themselves. I didn’t really have much to say about it though. It’s not because I don’t care, it’s more because other bloggers have basically said practically everything I want to say. But in a previous post I heavily criticized the sheer amount of condemnation for Korea or Koreans emanating from the K-blogosphere over the issue. I must reiterate again, that I don’t in any way approve of what happened. I think that it was and is wrong to make fun of other races of people, and ignorance is not enough of an excuse, especially when this is not the first time it happened, and there was a high profile backlash the last few times it happened. So if this is your view, then why were you so critical of other bloggers and their judgement of Korean society based on this incident? I said what I said because I learned about the incident from a Korean who hasn’t spent a long time overseas, who was outraged over it. I said that you can’t make a blanket generalization of the whole society based on one incident alone, without proper context. Saying that Korea is a racist country because this kind of thing is tolerated isn’t really fair, nor is it particularly constructive. Take a look at that guy in the picture. He’s a pretty famous guy. (John Lennon for those who are too young to recognize him, though honestly that would be hard for me to believe). WTF does John Lennon have anything to do with this? Is John Lennon a racist? You heard me…. Is John Lennon a racist? You’re kidding me right? The guy who wrote the song Imagine? The guy who wrote Give Peace a Chance? Basically one of the most influential figures of the 1960’s and the civil rights movement? The self-proclaimed feminist? The man hated by “the man?” You have got to be kidding! No way! John Lennon was not a racist! He was the personification of peace, tolerance, and brotherhood of man! Did you ever listen to his music? Come on Euge, what the F are you talking about? Woah woah! Slow down! 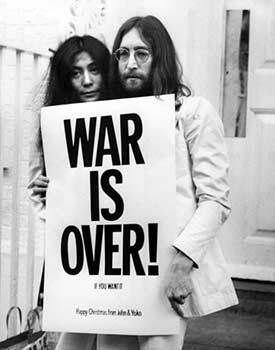 I agree, John Lennon was not a racist, and stood for the end of racism and peace and love between all men and women. I’ll get to my point after the jump. The K blogosphere has been up in arms about blackface. Apparently some Koreans took it upon themselves to paint their faces up to look like some cartoon character who is himself questionably offensive. If that character himself isn’t offensive, then the cartoon itself is, because it depicts Africans with bones through their noses. But we didn’t know it was offensive! Now, why am I writing this post? Plenty of other K-blogs have condemned the Korean media/Korean education/Koreans themselves for this action. I’m not going to do either of those things. I in no way support or condone what has happened and I am thoroughly disappointed, but this post is about the other bloggers. My good friend Roboseyo was probably the least vitriolic of the bloggers who wrote about this issue. Other bloggers took the chance to point out that this is proof that Koreans or Korea is racist. I’ll have you know that this particular blackface incident was not learned from a fellow blogger or fellow expat… A Korean person who has never lived abroad and who doesn’t interact with foreign people on a regular basis pointed it out to me and was very distraught about it. “How on Earth could something like this happen!” were more or less the exact words. So my friends, this may only be one example out of many, but we have to realize that not everyone in Korea feels that this is not a problem, and that Koreans themselves are not a hive mind. Are there racists in Korea? Yes. Are all Koreans racists? No, and far from it. Express outrage over the issue and boycott the station or organize a campaign to promote awareness of this issue.. but don’t make it worse by stereotyping an entire nation of people.